BOGO offer on The aerie collection (includes 160+ new arrivals). Buy one, get one 50% off. Second item must be of equal or lesser value. 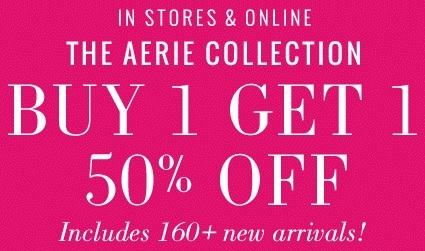 Offer is valid at aerie stores in the U.S. and online. Source of the information is aerie. Offer ends 10/08/2015. More information available at US aerie stores and online.